Whether you have always wanted to learn the language of your ancestors, or if you are simply a fan of Italy and Italian culture, we invite you to learn with us! If your schedule doesn’t allow you to join a group, please note that we offer individual programs that can be scheduled as and when needed, or you can form a group just for you and your friends at a time that works for you. 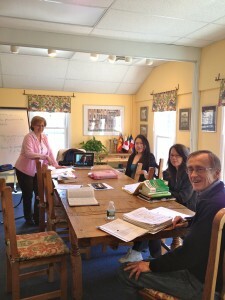 Our programs are suitable for all age groups be it for academic purposes, enrichment, or to prepare for travel to Italy. Wed 10:00-11:00 AM This program is for students who are continuing to learn Italian, and will be mostly taught in Italian. New students are welcome to join program subject to an evaluation and space. NEW! This program is for beginners or those who’ve been exposed to Italian some time ago and who’d like to reconnect with the language. The program will start subject to sufficient enrollment. If you know some Italian from before, call us to schedule a visit in order for us to evaluate your level, and you could join an existing group. Individual programs are available for those who are unable to join a group. Smaller private groups can also be formed. New groups can be formed throughout the year, at times not announced in this program.